When the Washington Capitals took steps on rebuilding in 2004, they had to find defensive prospect that could replace a proven talent in Sergei Gonchar. There was a trade with Boston and the Capitals found their prospect. A big defenseman drafted by Boston in the 2001 draft. He was a product of the Kamloops Blazers out of Kamloop British Columbia where he accumulated 25 goals and 57 assists in 179 games played (a span of 3 years). It was Shaone Morrisonn (pronounced like Shawn). He was drafted in the first round by Boston then traded to Washington in 2004. 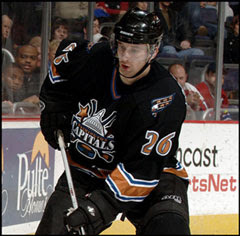 Shaone finished his second full season with the Capitals with 3 goals, 10 assists and a +3 in the '06 - '07 campaign. Shaone has been the go-to guy when it comes to opposing teams top lines. He would end the year with defensive partner Milan Jurcina, another prospect traded from Boston. The two found chemistry and quickly found themselves as the first defensive pairing for Glen Hanlon’s team. Shaone was nice enough to answer my some questions. He is the first Capital to be interviewed on Puckhead’s Thoughts. So give a nice welcome to Caps’ big guy, Shaone Morrisonn and some of his thoughts. P.H.T. I know that this was a very up and down season for the Capitals. It seems every time you guys really seemed to get it going, something always seemed to slow you guys down. All in all, what goals were you able to accomplish this year? S.M. Personally, I have had my second full year to establish myself as a shut down defenseman and to develop more confidence in my offensive game. As a team we have had an up and down year. We have dealt with injury slumps, and trades which have enabled us to grow together and develop more experience for the future. P.H.T. What do you think the goals are for this squad next year, what do you hope to accomplish next season? S.M. Playoffs are in our plans for next year and, personally, I would like to have better overall numbers and become a leader on the defensive core. P.H.T. What has it been like this season to defend some of the best players in the League? Do you get to brag to friends when you get home, "Well, I did shut down Jaromir Jagr this winter, what have you done?" S.M. I am honored that I have had the opportunity to play against the best players in the world and I love the challenge every night. P.H.T. What are your plans for this off-season, what do you feel you have to work on this summer? S.M. I'm going back to Vancouver to workout, train, and work on all aspects of my game. I'll be strength training without losing any of my speed. P.H.T. Which team do you look forward to playing against? S.M. Playing in Montreal, there is not a better experience in hockey then the Montreal crowd. They are passionate and knowledgeable; I get goose bumps every time I play there. They have so much history and success in that organization. P.H.T. And the team you hate to face? S.M. I don't enjoy playing in Atlanta. We have a very heated rivalry and they play hard at home, and personally I don’t care for them much. P.H.T. What has been your personal highlight of this year? S.M. I would have to say playing in Vancouver was the highlight of the year it has been along time since my family and friends have had the chance to see me play live in my hometown. P.H.T. What has been your personal lowlight of this year? S.M. Not making the playoffs. P.H.T. Have you had a chance to see the new jerseys for next year? S.M. I love the red white and blue. It is fitting for us being in the nation’s capital wearing America’s colors. P.H.T. I know you have been practicing in the new Reebok jerseys at the end of the year, what are your thoughts on them? S.M. The state of art Reebok jersey fit tight and comfortable and is very light; it’s was a huge difference. P.H.T. What are your thoughts on the League possibly using bigger nets for more scoring next year? S.M. I like how the game is now. We don’t need to make anymore changes. Our game is fast, physical, and very entertaining. P.H.T. Okay, I am going to ask you to put your general manager hat on. With due respect to management, of course, what do you think this team needs to take it to that next level? S.M. Well I think as a core group guys having two full seasons of development under our belt, we need to be accountable and relied on more next year. We need to bring in two or three veterans and we'll be right in the mix of things next year. We also need to limit the injuries. P.H.T. What are you personal goals for next season, what does Shaone want to accomplish when the next 82 games are played? S.M. I would like to play in every game, be consistent every night on all tasks, continue to be a vital player, help the team reach the playoffs, and contribute more offensively while remaining a strong defensive force. Thanks Shaone for answering my questions and being Puckhead’s Thoughts’ first interview. Shaone will be a restricted free agent at the end of next season, and most likely be resigned as he has been a bright spot for the Capitals over the past two seasons. Depending on summer signings, Morrisonn will again be on the top defensive pair. Thanks, I have always liked this player. I appreciate your efforts to obtain the interview.